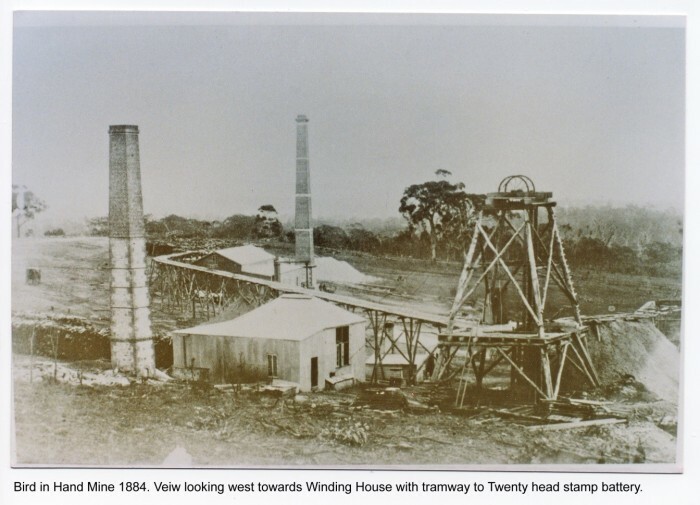 Bird-in-Hand Gold Project (Project) is situated on the site of the historic Bird-in-Hand gold mine, located 2.7km from Woodside in the Adelaide Hills, 30km east of South Australia’s capital city, Adelaide and 35km north of Terramin’s existing Angas Zinc Mine (Angas) at Strathalbyn. The Bird-in-Hand mine was one of 17 gold mines in the Woodside goldfield which produced over 30,000 ounces between 1881 and 1889. The Bird-in-Hand mine was the largest of these mines producing 10,500 ounces of gold at an average grade of 12.9g/t in the late 1800’s. Mining at Bird-in-Hand ceased when a water fracture was intercepted by the underground miners, with the subsequent water inflows being uneconomic to manage with the 1880s’ technology. Mining interest and capital support then went to the newly discovered Broken Hill region and subsequently Bird-in-Hand mine was closed. In late 2013, Terramin purchased the Project and with it a portfolio of highly prospective Adelaide Hills exploration tenements. Terramin revised and released a Bird-in-Hand Resource (2018 Resource) estimate of 650,000 tonnes at 12.6g/t gold for 265,000 ounces. The proximity of the Project to Terramin’s existing mining and processing facilities at Angas allows for road haulage along existing sealed road infrastructure. Terramin plan to utilise their existing processing plant to produce gold doré and concentrate. The Project proposes to have an underground access with a cut and fill mining method, flotation and gravity concentration, to produce doré and gold concentrate. No acid leaching or cyanidation will be used in the process. Terramin plans to undertake mining on an owner/operator basis. Start-up capital costs are estimated to be approximately $25.6m (including initial underground development). A major concern for all stakeholders, particularly Terramin, is the impact a mining operation will have on the regional groundwater and possible effect on groundwater users. A study was commissioned with the assistance of specialist hydrogeological group; Australian Groundwater Technology (AGT). The groundwater study began with a review of all current and historical data relating to the regional groundwater and the Western Mount Lofty Ranges Water Allocation Plan. A groundwater and bore census is underway in co-operation with 37 local Landowners, which has included over 70 bores to date. Groundwater loggers have been installed in a number of bores to accurately measure the impact of pre-mining activities throughout the varying stages of the irrigation cycle. Following discussions with the Environmental Protection Authority (EPA), Department for Environment and Water (DEW) and Department for Energy and Mining (DEM), approval was received to undertake construction of five investigation bores and pump testing of those bores to determine the interaction of groundwater, aquifers and rock structures as well as investigate Managed Aquifer Recharge. The bores were constructed in July 2014 and in September 2018 and pump tests were conducted in August and December 2014 as well as February 2015, and February/March 2019. This work has shown that the majority of groundwater is confined to fractured rock zones which can be identified in the geological drilling and that the aquifer is amenable for Managed Aquifer Recharge. Other environmental work to date has included a flora and fauna study, which incorporated a field survey, conducted in October 2014. The study area was assessed for native vegetation cover, presence of flora and fauna species (including listed species) and key threatening processes (pest plants and animals), which will assist in describing the ecological environment. Additionally, a survey of habitat values of scattered paddock trees was undertaken. A total of 62 bird, 12 mammal, seven reptile and four amphibian species were recorded during the October 2014 survey. Ultimately, the study will help to inform Terramin of the potential impacts of mine construction and operations and develop appropriate measures to manage any impacts, as well as form a substantial element of the Environmental Protection and Biodiversity Act Referral. Noise, dust and traffic monitoring, and soil investigations have all been completed. In July 2015, Terramin purchased a strategic parcel of freehold land which will be used to develop the surface infrastructure for the Project. 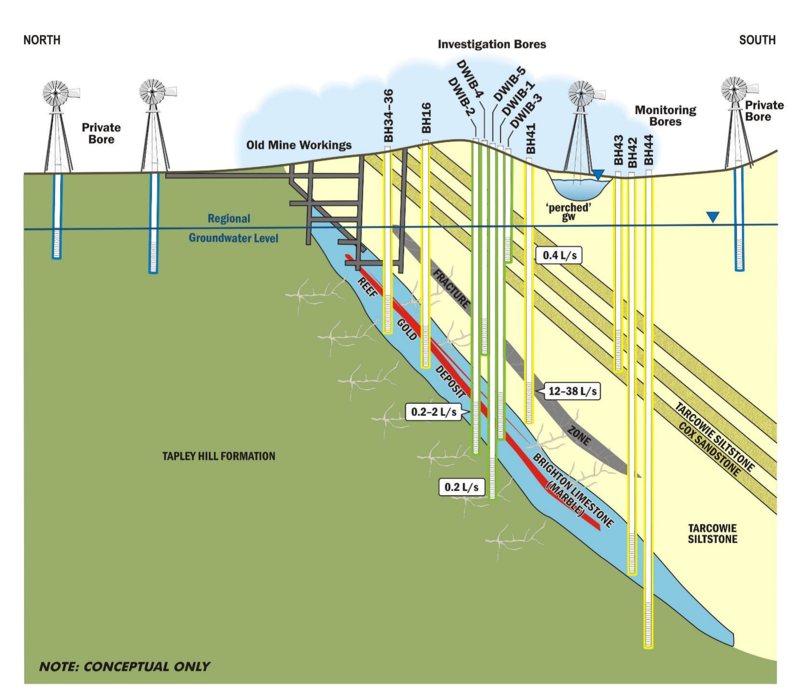 The potential to discover additional high grade mineralisation further along strike on the Mineral Claim is highlighted by the presence of historic mines which could be accessed from the Bird-in-Hand underground infrastructure including; Bird-in-Hand Extended and The Ridge, which are respectively 200m and 400m to the south of Bird-in-Hand. These mines were last worked in the 1890’s. The Ridge has a recorded production (incomplete) of 517 ounces of gold from 2,766 tonnes at an average grade of 5.8g/t gold from 5 shafts and more than 500m of drives. The recorded retreatment of 6,266 tonnes of The Ridge tails produced an additional 977 ounces (an additional 4.9 g/t bringing the average grade of The Ridge to 10.6g/t). Bird-in-Hand Extended had 1 shaft sunk to 30m and at least 80m of drives were developed. The lode was up to 6m wide and assayed samples averaged 25- 31g/t gold. Terramin is currently working with all stakeholders to progress the Project to begin the staged approval process which leads to a Mining Lease approval. For more information on Supplier Registration click here. To access the Project Information Fact Sheets, please click here.